Friends of ours have recently spent a week or so tootling through the hills in the middle of Hesse on hired e-bikes. 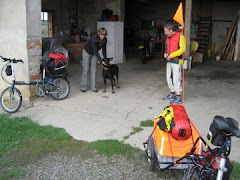 It is a seriously hilly district and our friends were very pleased to be able to cycle in comfort without having to get off and push or arriving at the summit of a climb out of puff, unable to speak. We have ourselves been thinking if we are ever asked to update our "Cycling in Switzerland" book from Cicerone that we'd try to scrounge or hire a pair of e-bikes to check the routes. However I don't think we wish to own an e-bike as long as the floor of the Rhine Valley in our part of the world stays flat. I am less than gruntled though about the proposals for a Radschnellweg (High Speed Bike Path) in various conurbations in Germany, especially in combination with the desire to run High Speed e-Bikes with maximum speeds up to 45 kph. The bikes are selling like hot cakes in the Netherlands. In Germany these can be used, but are treated as mopeds. The "drivers" of these bikes need a moped licence, must wear a helmet and the bikes themselves have a licence plate. These vehicles can only be ridden on bike paths where mopeds are allowed. I am pleased about this because we normally cycle around 15 to 16 kph and the vision of sharing a bike path with vehicles going three times as fast is not a happy one. I have heard recent comments that these restrictions will delay the development of high speed e-bikes in Germany. I can only say thank goodness!